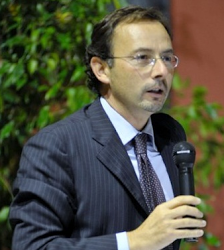 After graduating in Political Science from the University of Milan, prof. Pasini earned a Ph.D. in Sociology and Methodology of the Social Research from Università Cattolica del Sacro Cuore. Since 2006 he has been Associate Professor of Political Science at the University of Milan, where he teaches the courses of Political Science, Political and Administrative Systems and Local Government. Professor Pasini is also a member of the Board of Professors of the Ph.D. School of "Political studies: Institutions and Public Policies" of the same University. He is the head of the Health and Welfare branch of the ISMU Foundation in Milan and coordinates the Milan "Ethics and public administration" branch of Politeia. His research is mainly based on the study of the relationships between the political and the administrative classes, on public policies and social exclusion, on local government, and on the evolution of the Italian political system.